Happy birthday Jane Yolen (Owl Moon), Toshi Maruki (Hiroshima No Pika), and Holly Keller (Farfallina & Marcel). It’s the birth date of Mabel Esther Allan (1915–1998), Wood Street series. Thomas Edison (1847–1931) was born on this day, which is now National Inventors’ Day. In 1990, South African anti-apartheid activist Nelson Mandela is freed after twenty-seven years in prison. He will be elected president of his country four years later. Read Nelson Mandela: “No Easy Walk to Freedom” by Barry Denenberg. It’s Don't Cry Over Spilled Milk Day. Read The Moon Might Be Milk by Lisa Shulman, illustrated by Will Hillenbrand and Oops by Arthur Geisert. In February of 1896 the Massachusetts Audubon Society was founded, the beginning of the current national organization. It was established to protect birds and to discourage the women of the era from wearing bird plumes in their hats. The man honored by the name of the organization, John J. Audubon, has been the focus of thousands of children’s books over the years. 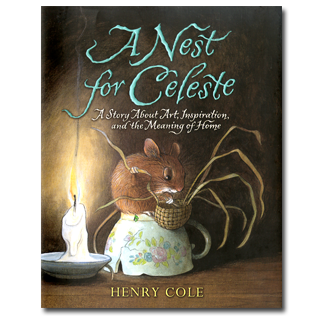 But Henry Cole’s 2010 book, A Nest for Celeste: A Story About Art, Inspiration, and the Meaning of Home, presents a slightly different portrait of this iconic figure than normally found in children’s books.. To begin with, the story is narrated by a young orphan mouse, Celeste, living in the Oakley Plantation, not far from New Orleans. She manages to find enough food in the dining room to keep alive, but a close encounter with a cat sends Celeste scurrying to the upstairs rooms of the house. There she finds a friend, Joseph, a teenage apprentice to Audubon who helps with the master’s painting. Joseph carries Celeste around in his pocket—so she witnesses Audubon killing an Ivory-billed Woodpecker or sketching a live Osprey held in captivity. In Celeste’s eyes Audubon looks the way he probably did to the birds that he captured or killed. Swept away in a rainstorm, Celeste manages to convince an Osprey to carry her back to the plantation. After Joseph leaves without her, Celeste settles into a home of her own in the attic, where she can invite other wild creatures to visit. Lavishly illustrated with brown pencil drawings, this old fashioned animal fantasy keeps readers riveted. Celeste charms everyone, including Joseph, and readers cheer her on as she finds a place of her own. Touching without being sentimental, the book has already found an eager audience of second through fifth graders. Even though the art helps the reader comprehend the story better, A Nest for Celeste works extremely well—with short chapters, lots of action, and delicious language—as a read aloud for both families and classrooms. If you use it for story time, just make sure that young readers have a chance to savor the artwork as well. Sometimes as publishers reprint books, they “downgrade the specifications”—print on cheaper paper or use flimsier materials for the binding. After its first printing, A Nest for Celeste was upgraded to better paper, so the artwork would reproduce with more detail. Consequently, the second printing is superior to the first in quality. Thank you Henry Cole for this fabulous new book—one ideal for those readers who love Charlotte’s Web or The Cricket in Times Square. Joseph reached between the twigs of the little cage and scratched Celeste under her chin. She froze, terrified. But Joseph’s voice was soothing and eventoned. He looked wistfully at Celeste and rubbed her tummy. Celeste closed her eyes and held her breath. I’m really not much more than a mouthful!she squeaked in panic, waiting for death. But Joseph seemed to ignore her squeaks and continued to talk. Originally posted February 11, 2011. Updated for . Have you seen Phillip Hoose’s Race to Save the Lord God Bird? It would be a great non-fiction companion to this book – all about the ivory billed woodpecker. Rebecca: The Race to Save the Lord God Bird was reviewed on January 5 –it does make a nice companion volume, particularly for those who like to pair fiction and nonfiction together. However, the audience for the Hoose is a bit older than those who would enjoy A Nest for Celeste. 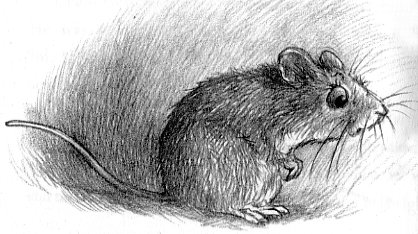 This great little book has done more for the mice in my house than any other since B. Potter. I was hopelessly entranced. I just finished reading Okay for Now (also about Audubon) with a group of 5th/6th graders. I bet this group would enjoy reading Nest for Celeste, as well. Dan: Yes, they are very different books, but both provide interesting perspectives. Somehow I missed this this am. I love this book & have recommended it to several teachers I work with-middle grade and one teacher whose class is studying birds all year used it as his first read aloud. It was a great beginning for discussions about birds and about approaching nature. Thanks for showcasing it.